Silk Road City Links - HISTORY'S HISTORIESYou are history. We are the future. Drumbeats rhythmically pounding in the distance, airy notes from a flute drifting by on the breeze, gentle tones from a bow drawn against strings, all punctuated by the sharp clash of cymbals–these made up the soundtrack of Chang ‘an during the Tang dynasty. Today this ancient city is known as Xian. The Silk Road begins in Chang ‘an, capital of China during both the Han and the Tang dynasties. It was the largest city in the world around 750 CE, as it was home to nearly a million people, with another million who lived just outside its imposing walls. Imperial buildings, temples and markets line the streets, and the city buzzes with activity. Foreign merchants, ambassadors, scholars, and musicians flock to this urban center, stocking the markets with exotic goods and filling the streets with sights and sounds from distant lands. Trade Goods: Beginning their journey west from Chang ‘an, trade goods included silk, porcelain, paper, ironwares, gold & platinum, lacquerware, furs, medicinal herbs (including tea) and, later, gunpowder, and printing. Things to do in Chang ‘an: To find out how your most important trade good is made, before your caravan departs you will want to visit a facility that produces silk . After purchasing Bactrian camels, fresh from Lop Noir, you will enjoy spending an evening out listening to traditional Chinese music played on cymbals, sheng, moon lute, drum, pipa, and erhu. While music was played all along the Silk road, it was a constant feature of life in Chang ‘an, enhancing rituals, telling stories, and bringing communities closer together though festivity and celebration. While enjoying your evening of music a man sits down at your table. He has an Italian accent, and he introduces himself as Marco Polo. You spend the evening in wonder, enjoying the fabulous tales he tells. http://idp.bl.uk/education/dialogue/index.a4d Some wonderful info here. For the Night of Music activity, be sure to click on the “Cultural Influence” link, and then click on the picture titled “Two Female Musicians.” I recommend, however, exploring all the tabs. If in your story you want to portray how peoples of different cultures communicated on the Silk Road you will find clicking on the “Sketches of Mudras,” the “Chinese – Khotanese Phrasebook,” and the “A Fourth Century Abandoned Wife” pictures. Throughout this site, I’m sure you’ll find much useful info to use during your travels. Along the Silk Road, Dunhuang served as the handoff point from the Chinese to the Central Asians. Serving as the westernmost fort of the early Tang Dynasty, Dunhuang was not only a key trading post situated on the “Silk Road” but also the military headquarters for Chinese operations in the Western Regions. Foreign merchants and monks from the West as well as officials and soldiers from central China brought their own cultures to Dunhuang and made the trading center a cultural “melting pot.” The economic, military, political and cultural activities which took place at this cross-roads provided the basis for the flourishing of one of China’s earliest Buddhist centers. Trade Goods: Because it was near Dunhuang that the Silk Road split into its northern and southern routes around the Taklamakan Desert, a wide variety of trade goods made its way through this cultural oasis. Some of those goods no doubt made their way to the garrisons at the “Jade Gate.” The most important good traded in Dunhuang, however, was Buddhist beliefs brought up from India. Things to do in Dunhuang: Then, as now, the Mogao Caves (also, see links below) are a true treasure. Fearing the perils of the open Taklamakan desert that lay ahead, or as thanks for a safe passage, Silk Road merchants and pilgrims passing through Dunhuang made donations to the Buddhist monks there. In return for substantial donations, the monks created cave shrines and filled those shrines with works of art to honor their benefactors – and the Buddha. Today, 1000s of Buddhist works of art remain. 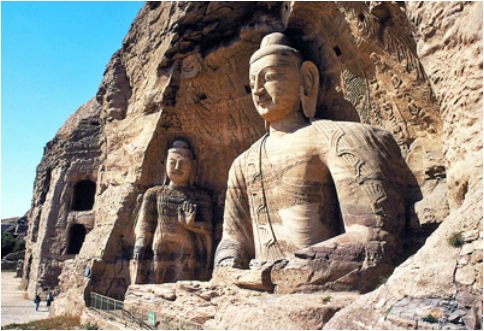 While in Dunhuang, you will visit with a Buddhist monk who will accept your caravan’s donation, give you a tour of the caves to view the Buddhist artworks, and explain the basic beliefs of Buddhism. (Turpan) After months spent baking under the blazing sun, your caravan has reached Turfan. At last, here is a lush oasis refuge from the harsh Taklimakan Desert of Central Asia. During the Han Dynasty, Xiongnu nomads fought bitterly with the Chinese for control of this important oasis town. The Chinese were eventually victorious and, with the aid and ingenuity of Chinese engineering, they built ingenious irrigation systems called karez to bring cool water from nearby mountains. Thanks to those irrigation systems you and your thirsty camels are afforded a refreshing drink. More important, the water allows farmers here to grow an incredible array of fruits and vegetables. What’s not eaten by residents or hungry travelers will be traded along the Silk Road, reaching kitchens thousands of miles away. Trade Goods: Turfan was famous for its Market. On a visit there, a Silk Road traveler would encounter stall after stall, merchant after merchant, selling such things as grapes, raisins, melons, pomegranates, wine, cotton, dye for porcelain, alum, Glauber’s salt, sapphires, jades and rubies, leopard furs, peacock feathers, and spices. Things to Do in Turfan: A stop in Turfan means a trip to the night market is a must. Stroll beneath the grape arbors, buy and sell goods at every turn, and pause in the market square to listen to a storyteller (see additional link below) share some fables from the Silk Road. Next, travel to the Bezeklik Caves at the base of the Flaming Mountains to see the incredible Buddhist artwork. While away from central Turfan visiting the Bezeklik Caves, you will stop in Gaochang, the military outpost turned capital city. It is there that you will talk with a soldier about the constant threat that the Xiongnu nomads pose to travelers along the Silk Road. Guangzhou is the eastern end of the Maritime Silk Route. At it’s height, Guangzhou was the busiest port in the world. Hundreds of ships sat at anchor in its harbor while hundreds more smaller vessels shuttled trade goods to docks already piled high with merchandise. Because of it’s status as an open port for trade, Guangzhou was one of the most cosmopolitan of all Silk Road cities. Strolling this bustling city, you would run into Persian, Arab, and Indian sailors and businessmen. In addition to traders, Guangzhou was home to the offices of governments from around the globe, and it hosted missionaries from equally distant spots. As a result, Guangzhou gave rise to a culture open to all faiths. Buddhism, Hinduism, Taoism, and Islam all thrived in Guangzhou. If you travel via the Maritime Route, you will be in the market for a dhow to transport your goods. Things to Do: If you are lucky enough to spend time in Guangzhou, you should plan your trip for the Spring when the city’s distinctive citong flowers are on full, fiery display. Make sure you spend time down by the docks. While there, listen carefully to the chorus of unfamiliar, distant accents that continually fill the air with song. It is harbor-side that you meet China’s greatest admiral and maritime explorer, Zheng He. Have tea with him at a cafe near the wharf, a place where he can keep an eye on his fleet of naval vessels, the largest wooden ships ever sent to sea. Have him tell you his tales of travel, trade, and conquest, and record his stories for the rest of the class. While in Guangzhou, you will also want to visit one or more of the cities fine Buddhist temples. Well worth the time to visit, those sites include the Guangxiao Temple, the Liurong Temple, and the spectacular Kaiyuan Temple. You will meet a Buddhist monk at whichever temple you choose to visit. He will give you a tour of the temple and teach you about Buddhism. The second-story rooms of centuries-old mud-brick houses nearly touch each other across an alleyway paved with hexagonal stones. Women wearing dark veils lean out of tiny windows. Poplar doors, painted bright blue or green and adorned with brass floral petals, stand half open—a subtle signal that the master of the house is inside. The noise of the nearby market provides a constant background din and the aromas of freshly baked bread and ripe peaches waft up from vendors’ wooden carts. You are in Kashgar, the Silk road handoff point fom Central Asians to Persians and Indians. Kashgar (great links below) is an important hub on the Silk Road, a vibrant Islamic center, it is the largest oasis city in Chinese Central Asia. Kashgar's importance is derived from its strategic position at the foot of the Pamir Mountains. From it's strategic position in the Tarim Basin, Kashgar commands access to the high glacial passes of the Silk Road routes into Central Asia, India, and Persia. Weary trade caravans plodding west on the northern and southern routes around the Taklamakan Desert meet up at Kashgar, leaving the desert hazards and demons finally behind them. After descending from the peaks of the Pamirs or the Karakorams, merchants heading east, bound for China, thawed out in Kashgar. It is in Kashgar that traders exchange their yaks and exhausted pack-horses for camels to take their merchandise into the desert and, later, to sell in the bustling merchant cities of China. Trade Goods: The market in Kashgar has renained busy for thousands of years. Merchants still come from miles and miles around to trade in the Kashgar market. During Silk Road times, merchants traded all manner of goods, both legal and illegal. Wares might include everything from basic home supplies to "miracle cures." However, Kashgar merchants were especially well known for their trade in pack-animals, tea, dried fruit, and medicinal herbs. Things to Do in Kashgar: A trip to Kashgar demands a visit to the Sunday market. Because of it's strategic positioning along the Silk Road, soldiers stationed in Kashgar to protect trade and to quickly suppress any uprisings in the region of the Western Areas are abundant. While in Kashgar, you will interview Ban Chao. Ban tells you about his life in the Western Regions and explains the threat of bandits on the Silk Road. (Hotan) Before the Silk Road there was the Jade Road, and for 2,000 years, Khotan supplied China with precious jade. While Khotan gained fame for the value of its jade trade, it also has a place in the story of the silk trade. After harboring the secrets of sericulture and maintaining a monopoly on the production of silk for thousands of years, in the 5th century C.E. silk worm eggs and mulberry seeds were, according to legend, smuggled out of China in an elaborate headdress by a Chinese princess when she went to her groom, the king of Khotan. From Khotan, the secrets of silk made their way to India, the Byzantine empire, and eventually Rome. In addition to jade entering China and Silk leaving China through Khotan, the city was also a major route for Buddhist thought exiting India. Trade Goods: In Khotan, you will trade for jade and for precious Buddhist texts. Things to Do in Khotan: During your stay in Khotan (also spelled Hotan, Hetian, or Yutian - the Chinese word for jade is "yu"), you will go down to the White Jade and Black Jade Rivers to gather and process jade. Later, you will take your prize jade to the Khotan market. In the market you will meet a "friendship princess" and a Buddhist monk who will tell enthralling tales of their life in the Western Regions of China. Northwestern Indians who lived near the Ganges River played prominent roles as middlemen in the China-Mediterranean silk trade. As early as the third century AD, they understood that silk was a lucrative product of the Chinese Empire. The trading relationship between the Chinese and the Indians grew stronger with increased Han expansion into Central Asia. The Chinese would trade their silk with the Indians for precious stones and metals such as jade, gold, and silver, as well as cotton, dyes, spices, and herbal medicines. The Indians then traded the silk with the Roman Empire. Later, as the overland route declined in use and as the maritime route began to dominate trade, Indians continued their role as Silk Road middlemen. Trade Goods: Indians served as middlemen on the Silk Road. Due to its central location, India was key to trade between east and west, as well as Africa. Products that India produced included cotton, herbal medicine, precious stones, and jade. It's most important export, however, was Buddhism. Things to Do in Delhi: You will depart for your trip to India from the Chinese port town of Guangzhou. As you gather supplies in Guangzhou and ready for departure, you observe a great number of Buddhist temples. With your trade goods, you will travel to India aboard a dhow, a popular Indian Ocean transport vessel . India is well known for the textiles they produce, the herbal medicines they use, the great variety of spices (Control F = India) they grow and, of course, for Buddhism. While in Delhi you will will trade for Indian cotton and spices. During your stay you will meet with Xuan Zang, a Chinese pilgrim who has come to China to translate sacred Buddhist texts. Reflecting on the Buddhist temples you viewed in Guangzhou, you ask Xuan to explain the basic beliefs of Buddhism to you. For 2,500 years the great Sogdian capital of Samarkand was the wealthiest city on the Central Asian Silk Road, ushering bales of Chinese silk through to Byzantium. When Alexander the Great entered Samarkand, he remarked on the city's profound beauty, In A.D. 751, an Arab victory at the battle of nearby Talas meant captured Chinese artisans were forced to divulge the secret of papermaking. In the 14th century, Tamerlane made it his capital and rebuilt much of the city, giving Samarkand the distinctive architecture that marks its beauty today. Trade Goods: It's been said that the Sogdians created wealth rather than products, trade rather than trade goods. Due to their central location on the route from Chang 'an to Rome, the Sogdians of Samarkand became great traders and caravan leaders. So prevalent were the Sogdians in Silk Road trade that their Sogdian language became the unofficial business language along the route. ​http://www.festival.si.edu/past_festivals/silk_road/program_nanji_niyozov.aspx - Control F = Judaism). The Ferghana Valley runs for 250 east-west miles through Central Asia. Since the 2nd century BCE, the great Silk Road connecting China and Mediterranean countries ran through Ferghana. In the 2nd century BCE, it was called Ershi and was the ancient capital of Davan. As the Chinese military explored the Western Regions during that time period, discord with China caused war between China and Davan. It was in Ferghana that agents of the Han Emperor Wu di signed an agreement ending that ended the warfare and opened trade between the two nations. The signed pact serves as a symbol of the opening the great Silk Road. Trade Goods: For its lush, fertile valley, Ferghana is a welcome sight for Silk Road travelers. Merchants to the area sought rugs, nuts, copper and, for the Chinese especially, the Ferghana Valley's "Heavenly" or "Blood Sweating" horses. Things to Do in Ferghana: While in the Feghana Valley you will definitely want to purchase some of the fabulous Heavenly Horses. These "Blood Sweating" horses are highly valued in China, especially by the Chinese military. You'll also meet the "accidental discoverer of the Silk road," Zhang Qian, as he gathers his belongings and readies himself for the long trek back to Chang 'an. The journey along the Silk Road has taken you thousands of miles from the imperial city of Chang 'an, China. At last, you have arrived at its western rival, Baghdad, capital of the Islamic world. Founded in 762, this elegant metropolis is known as the City of Peace. Its gleaming palaces and fragrant gardens look down on Iraq's Tigris River; foreign goods arrive daily by ship as well as by camel caravan. An illustrious family of Islamic rulers, the Abbasids, holds court here. Under their patronage, Baghdad has blossomed into a remarkable center of learning-a meeting place for scholars, scientists and philosophers and a storehouse for knowledge from many lands. Trade Goods: In Baghdad, you will trade for dates, nuts, dyes, lapis lazuli, glass, and the teachings of Islam. Renowned for its "Library," often referred to as the "House of Wisdom," important discoveries in mathematics and the sciences began here. Things to Do in Baghdad: While visiting this middle-eastern metropolis, you might stop by one of the many glass (scroll to early Islamic glass) studios or stroll the city and take notes on Abbasid architecture, epitomized by the Abbasid Palace. However, the curious Silk Road traveler must stop at Baghdad's "House of Wisdom" (Be sure to click on the "Famous Scholars link at the very bottom of the page). When requesting directions in town, you might ask how you get to the library. However, this famous facility is much more than a repository for books. In fact, rather than being a single facility at all, Baghdad's House of Wisdom is several facilities and open-air learning centers where scholars and students meet. Baghdad was considered the center of learning for its time, and the "House of Wisdom" functioned much like a modern research university. Abbasid rulers sought out scholars of all faiths who gathered around the city to try out new ideas and break ground in the areas of philosophy, astronomy, and mathematics. On your visit to the House of Wisdom, you will meet an Islamic scholar to learn about one of the world's most widely practiced religions. http://galileoandeinstein.physics.virginia.edu/lectures/AthenstoBaghdad.htm scroll down the page to "The Advent of Islamic Rule." Damascus, the capital of Syria, is one of the oldest continuously inhabited cities in the world. In addition to serving as the capital of modern Syria, Damascus was host to Egyptian, Greek, Roman and Ottoman empires. Situated in the Ghouta Oasis close to the Barada River, Damascus was able to prosper in an otherwise inhospitable barren landscape. Due to its location, ancient Syria served as a vital link for Silk Road trade. For west-bound traders, the city became a last place of rest before making a short journey to the Mediterranean and transferring goods to transport ships. Sitting in such an ideal place along the ancient Silk Route, Damascus became a thriving commercial city, noted for its cloth, dried fruits, grains, almonds, and products made from the city's famed "Damascus Steel" (Be sure to explore additional links and images.). Because of its location, culture in Damascus was also influenced by religious traditions that emerged in the region. Early in the Common Era (C.E.) Damascus converted to Christianity. It was on the road to Damascus that St. Paul (d. 67) experienced his dramatic conversion to Christianity, and it was from Damascus that he escaped persecution and the threat of assassination by being lowered down the wall in a basket. The Roman emperor Theodosius I in 379 CE had a Christian church built on the foundations of the Roman temple of Zeus. Later, Damascus became a center for Islamic thought and served as the Caliph's administrative center from 661 to 750. As a result, Damascus is home to one of Islam's great places of worship, the Umayyad Mosque. Trade Goods: While in Damascus, you'll bargain for almonds, purple dye, dried fruit, glass, cloth goods and the highly valued Damascus steel. In addition you may see either the rise of Christianity or Islam. Things to do in Damascus/ Palmyra: Damascus steel is highly valued for its strength and distinctive beauty, and you are interested in purchasing products made from that sought after material. Due to its value, China has sent you to Damascus to learn the secrets of its production. As a result, you will spend a morning at the forge where the steel is produced, learning how to produce such fine steel while you are there. Later, you have a dinner appointment with Paul of Tarsus in the city's old town. There, you will certainly want to ask Paul about his conversion to Christianity and have him explain to you the differences between the Christianity that he practices and Nestorian Christianity. http://travel.nytimes.com/2007/06/24/travel/24Syria.html?pagewanted=all Be sure to click link to slide show. http://archaeology.about.com/od/transportation/tp/Silk-Road-Cities.htm Links to more places on page. http://www.infoplease.com/encyclopedia/world/damascus-history.html Short description of the stay there of Jesus's disciple, Paul. The city we now know as Istanbul was founded by Greek colonists in 657 BCE and, at that time, was named Byzantium after the legendary King Bezas. Spanning a period of over 1500 years, the city on the Bosporus served as the capital of three empires - the Roman Empire, the Byzantine Empire, and the Ottoman Empire. Among the reasons that leaders valued Istanbul as a capital city was its strategic importance as a link between Europe and Asia. Istanbul's geography has always been its great gift. Located on a small peninsula, surrounded on three sides by water, blessed with favorable currents and easy access to both the Mediterranean Sea and the Black Sea, Istanbul is the only city in the world whose borders extend into two continents. With those advantages, Istanbul has always served as a cultural and economic bridge between the East and the West and, because of that, Istanbul was an important Silk Road city. Istanbul's history is deep, and rich. By the 4th century CE, the Roman Empire had become too large to govern and too corrupt, and it had already begun its slow slide into disarray and decay. As a result, the Roman Emperor, Constantine the Great, who foresaw the decline of Rome established an eastern capital in the city. In 330 CE Byzantium was re-christened Constantinople, after the emperor. By the time Rome fell to invading barbarian tribes in the 5th century, ushering in the European "Dark Ages," Constantinople was booming and, with the fall of Rome, became the capital city of the Byzantine empire. Future leaders continued to expand Constantinople. Notably, Emperor Justinian saw the completion of massive defensive walls whose remains still surround the old city. He also built the Hagia Sofia (pronounced Eye-ya Sofia), one of the world's great monuments to faith and, tired of paying high prices for Chinese silk, sent two emissaries east disguised as monks to steal silk worms. Their mission was a success and, in the 6th century Justinian began the Byzantine silk industry. While the Dark Ages cast their shadow over Europe, east-west trade continued and Constantinople benefited both economically and culturally. The economic importance of Constantinople was in part a function of its becoming one of the largest cities anywhere in the world. By the 5th century, it held around 300,000 inhabitants; by the middle of the 6th, the population had grown to over half a million. One testament to Constantinople's cultural richness can be found in the diversity of religions that worshiped free of persecution in the city. Long after Constantine's conversion to Christianity, pagans and Jews practiced their faith with few restrictions. After the rise of Islam in the 7th century CE, a Muslim community took root there as well. By the 8th century, Islam had spread throughout the Middle East, north Africa, and into Europe via the conquest of Spain. In the 15th century, the Selchuk Turks finally conquered Constantinople and Osmani the Great made the city the capital of his newly formed Ottoman Empire and converted the many Christian cathedrals into mosques. Trade Goods: Because of its key location linking East and West, in Istanbul you can find nearly every Silk Road trade good, including the bubonic plague which decimates Istanbul in 542 CE. Popular trade items included pistachios, dates and figs, spices, wines, woven materials such as the still valuable Turkish rugs, and metal-ware. Depending on the time you visit, in addition to material goods, you may trade for Christian or Islamic art. Especially valuable were the Byzantine Christian mosaics and Islamic tiles (Additonal links below). Again, depending on the time of your visit, you may also come away with a new set of either Christian or Islamic beliefs. Things to do in Istanbul: Any time after the 525 CE, a visit to the Hagia Sofia is a must. It remains a marvel of art, architecture and engineering. After the Ottoman conquest of Constantinople, the Hagia Sofia was converted into a mosque, and it would be an amazing time to witness not only the transformation of the basilica but of the city as well. If you visit in the late 16th century, you should visit the Mosque of Suleyman the Magnificent. It was designed and built by Mimar Sinan. Greatly admired by artists and designers the world over, including Leonardo DaVInci in his own time, Sinan is one of the greatest architects of all time. Other sites to see include the Hippodrome, the Egyptian market, also known as the Spice Market, and the Grand Bazaar, the largest covered shopping space on earth. In addition to visiting those sites, you will learn about Byzantine mosaics and Islamic art. http://archaeology.about.com/od/cterms/g/constantinople.htm Be sure to follow links that begin about half way down the page. Traditionally, it's said that Rome represented the western terminus (end) of the Silk Road. In fact, that is misleading. It would be more appropriate to say that the Silk Road's western end was the Roman Empire. While Rome itself had little direct role in Silk Road trade, it is true that, almost from their first glimpse of silk, the Roman population fell in love with the fabric. Silk became a highly sought luxury, so expensive that at first even wealthy Romans could only afford to sew a thin strip of Silk to their togas. As the craze for Silk grew, however, the Romans imported ever more of the fabric. In fact, Rome was importing so much of the expensive material that Roman historians wrote of their fears of silk bankrupting the empire. On several occasions, the Roman senate even passed decrees outlawing silk, all to no avail. The truth is, Rome existed as a strong capital city for only a small portion of the time that the Silk Road was active and expanding. It's true that Rome reached its peak of power during the early centuries of Silk Road trade, and the importance of that fact should not be overlooked. An emerging and increasingly wealthy Roman population did provide a distant market for Chinese silk. It might be said, however, that Rome's more important and longer lasting contributions to Silk Road trade happened not due to Rome's desire for silk but, instead, because of Rome's desire for land. You see, as the Roman Empire expanded east, it absorbed already existing trade routes and, in the Roman way, made physical improvements to those routes. They also brought Roman construction and organization to already existing trade towns and built new cities along the way. It was those expanded trade routes and the lasting Roman influence in cities through a wide region that had the longest lasting effect on the Silk Road. After Rome's collapse in the 5th century CE, power of course moved out of the capital. During the Middle Ages, the Venetians and Genoese, rather than Rome, controlled the bulk of the Mediterranean trade which connected to the major trading centers of Constantinople, Antioch and Alexandria. Trade Goods: If your caravan makes it this far, you are in for a treat. The Roman's are wealthy and they love silk. While in Rome you will exchange your goods for wine, gold, colored Venetian glass, olive oil, and Roman pottery/art. Things to do in Rome: While in Rome you will visit the Pantheon (see more links below). Be able to give an overview of the building and describe its various parts - its portico, its rotunda, and its interior. Take the time while there to explore both Roman gods and religious practices (Roman paganism) and Roman engineering. You will attend a show at the Colosseum, observing both the "entertainment" and the audience reaction. Were events at the Colosseum simple entertainment, or did they serve a larger social purpose? For a side trip, you will travel the Roman roads north to visit a glass-making facility in Venice.